You can "stretch" the page by pulling on the lower right hand corner of the website so that the maps and spreadsheets fill your entire screen. Photos were taken with a camera that embeds the GPS coordinates; they were uploaded to Google Picasa Web Albums, the KML file was downloaded, and the KML file was then uploaded into Google Maps to create the maps that are embedded in this section. Notes taken in the field at the time each photo was taken were entered into an Excel file, which was uploaded to Google Spreadsheets and embedded below the map. To cross reference between the photos and the notes click on the icon in the map and look in the upper left hand corner of the pop-up for the photo number; this is the same photo number used to index the notes in the spreadsheet (first cell in each column). The Google Maps that are embedded in this section open in Terrain View. You can change them to Map View, Satellite View or the 3-D Earth View by clicking on the buttons in the upper right hand corner of the map. You can also zoom in or out, and move North, South, East or West by clicking on the arrows in the upper left hand corner of the map (or by double clicking on the map or dragging the map with the hand tool). Click on the photo icons in the maps to see larger versions of the photos. The photo will appear in a balloon that contains the Photo Number. You can use this number to locate information about the photo in the spreadsheet that is embedded in the page below the map. The data below the Google Maps in this section are entered into Google Spreadsheets (viewable online) and are downloadable from the attachment section at the bottom of the page as Excel Spreadsheets. Below you can find information about the types of data that were recorded in the field for each photograph and transcribed into the Excel and Google Spreadsheets viewable on pages in this section. Photo Number: This is the archival number for each photo. Link to Picasa: This is a hyperlink to the photo that has been entered into a web album in Google Picasa. Clicking the link will take you to the photo. Date: The camera date stamp was incorrect in 2008. The correct date is recorded in the spreadsheet. Time: The time was recorded at each River Mile. GPS: The GPS coordinates were read off the photo. All photos were taken with a Ricoh Caplio 500SE GPS camera. Location (river mile): The inventory begins at Junction City which is River Mile 173 and ends at Kansas City Kansas at the confluence with the Missouri River (River Mile 0). Locations are recorded as a bin, with the photo numbered according to the previous River Mile. For example, if the photo was taken at RM 171.8 it would be recorded as RM 171, if it was taken at RM 172.3 it would be recorded as RM 172. River Mile Photo: An "x" in this category indicates that the photo was taken downriver at the River Mile. An RM photo was taken at each River Mile to portray the general condition of the river. Right bank/left bank/island: Location of object (for example, stormwater outfall) when looking down river. Direction photo taken: The direction (North, South, East, West) the camera was pointed when the photo was taken. County: The county in which the photo was taken. When the river forms the border of the county it is included in both counties. River Width: Approximate, as estimated by Laura Calwell when the photo was taken. CFS: Cubic Feet Per Second as found in the USGS stream gage archive for each date and location. An x in one of the following rows indicates location of structure; discharge and description; bank stabilization and material used or need for cleanup or restoration. Notes (taken in the field): information such as the names of bridges, known outfalls, etc. The U.S. Geological Survey operates an extensive network of stream gauging stations in Kansas and across the nation. They provide real-time stream stage and streamflow, water-quality, and groundwater levels for over 7000 sites. The real-time water monitoring network is available here. These sites are also visited by field crews, who maintain the equipment and manually measure the gauge height and calculate the rate at which the water is flowing. It is these field measurements that we have included on our spreadsheets for reference. We chose the date nearest to the time we passed the gauge while conducting the river inventory. USGS gauging data: In this column we have noted the picture number which is nearest to the gauging site. Site number: The unique 8-digit number used by USGS to reference gauging sites. Site name: The unique name used by USGS to describe gauging sites. Date: The date on which the measurement was taken. Time: The time at which the measurement was taken. GPS location: The GPS coordinates of the gauging site. 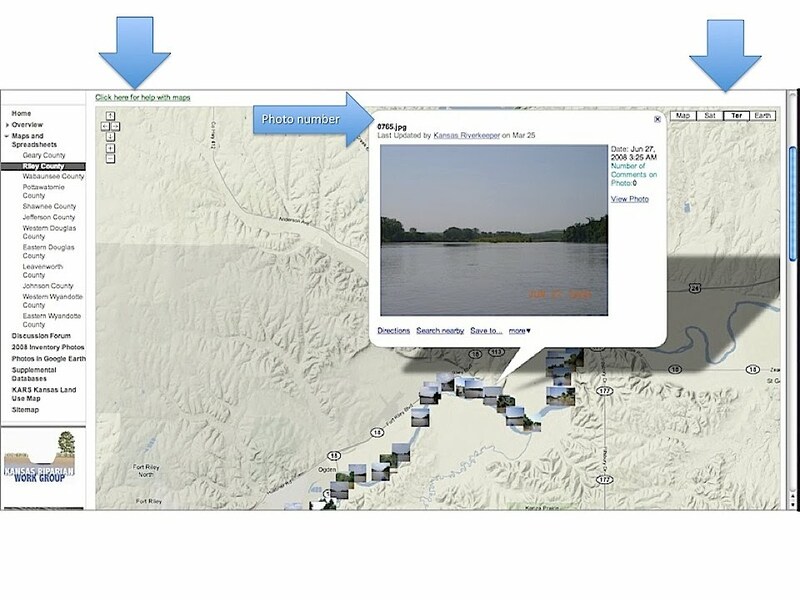 These coordinates may be entered on google maps to observe the proximity of the gauge to our river inventory photos. Streamflow: The rate at which water is passing a particular point in a stream, measured in cubic feet per second. Gage height: The height of the water surface above the gage datum (zero point), measured in feet. These data (KS) may be accessed by visiting the list of sites here. Click on the desired station number - choose "SUMMARY OF ALL AVAILABLE DATA" from the drop-down menu at the top of the page - Choose "field measurements" to access data tables.